Technisoft has introduced a completely new print set-up module with the newest version of EXACT and ALCHEMIST. This module caters for all printing, e-mailing and faxing for documents produced out of the Customers and Suppliers Invoicing modules. Please note that because these facilities are extremely powerful they need to be set up by a person in your organisation with managerial skills who understands what is required in your business. The following description refers to the Customer module, but the Suppliers module is set up in exactly the same manner. A red square that will appear when changes have been made and not updated. We will deal with Standard Items first. The third thing to notice is the message that Dot-matrix templates CANNOT be used on graphics (laser or ink-jet) printers. Firstly please ensure that you have generated the correct basic default templates. Bear in mind that if you have previously made changes to templates for invoices, etc. and have saved these templates with the same name as the default templates, performing the next operation will overwrite your changed templates. This is why, when you make changes to the templates that we supply as defaults, it is advisable to save the templates with a new filename. If you use both dot-matrix and laser/ink jet printers, tick both boxes. The templates will be created. If you are making changes to the Print setup that are specific to the terminal upon which you are working, then you should press the button before making the changes and save the template with this button depressed. If you are making changes that you would like to make available to other workstations on your network click the button and then save these settings with this button depressed. You may go to another workstation and, by clicking on the button on that machine, you will be able to immediately load the same settings on that machine. In the "Printer" field use the downward-pointing arrow to select either Laser/Ink Jet or Dot-matrix, depending what printer is being used by this computer. You should enter the number of lines that your forms can handle (usually 48, 51 or 66). There are 6 lines per inch. If you have an Epson printer or if your printer has been set to emulate an Epson, then, when you save the settings, if you have entered no initialisation values here, the following screen will appear and you may accept the values inserted. If you do not have an Epson compatible printer, you will need to know, from your printer manual, what the initialisation numbers for your printer will be. Now please tab to the next field "Print template" and select the correct template by clicking on the "Open Folder' icon at the right-hand end of the field and selecting a template file. Tab out to the next field "Printer [Tray 1] and select the correct printer from the drop-down box that appears when the down arrow is clicked. You will see that a facility exists, in the next field "Tray 2" to direct the same document to a second printer or a second tray in the same printer. This function allows, for example, the printing of a document to two different colour papers. Under "Copies" you must select how many copies of the document you wish to print, and if you select the "Preview" box you will be shown a screen preview of each document before it is printed. If this box is ticked, the two Preview options boxes and the Preview interface selection will become available for selection, as shown below. If you wish to fax these documents you should tick the first box "Preview can be redirected for printing (e.g.Fax)"
If you want the preview to automatically close after printing tick the relevant box. This option allows you to print the document and to send via e-mail if you are using a version of Outlook prior to 2003. If you are using newer versions of Outlook this selection will not allow you to e-mail properly out of the system. This option allows you to print, e-mail via a mapi interface, export to a pdf or a MS Word document, and to fax directly out of the system. In other words, this component which has been specially written by Peter Reber actually works, whereas the other crap (Standard Option) that comes with Fast Reports does not! The options should now be saved by clicking on the relevant [Save setting] button. You will see the red block turn green. If you now click the button and then save these settings again you may go to another workstation and, by clicking on the button on that machine, you will be able to immediately load the same settings on that machine. There is one other tag that may need attention if you ever wish to fax documents directly out of the system - the [Fax] tag that may be on the right of the grey-green group, depending if there is an option to fax the document. Please note that a fax template must always be a graphics (laser or ink-jet) template. Remember to press F12 or [Save] when you have finished in order to save all of your changes. Repeat the above for each type of document that your company needs to have printed by selecting the tabs for the different documents, as shown below. There are two other functions that may be invoked in special cases. They are the and the options. 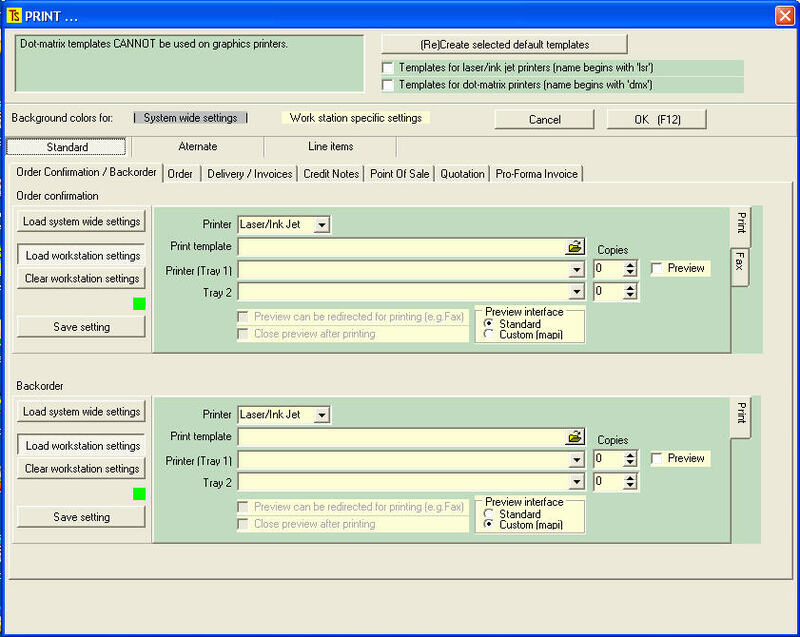 This option allows you to set up alternate, globally applicable templates for Delivery Notes, Invoices and Credit Notes. If these templates are set up, then you may go to a specific customer's record (Under Customer [Maintenance] [Customer]) and on the [Balances] tag, you will see there is an option to select these alternate templates for that specific customer. 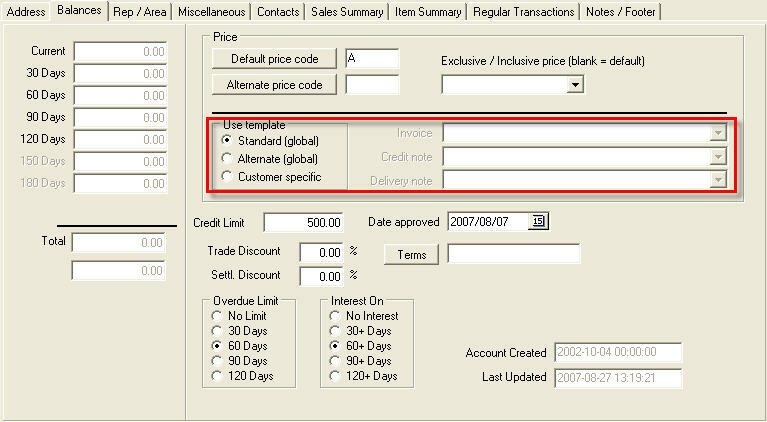 Note: There is even an option to set up templates for these documents that is unique for a specific customer by selecting the [Customer specific] radio button and inserting the relevant templates! See below, red-bordered area. 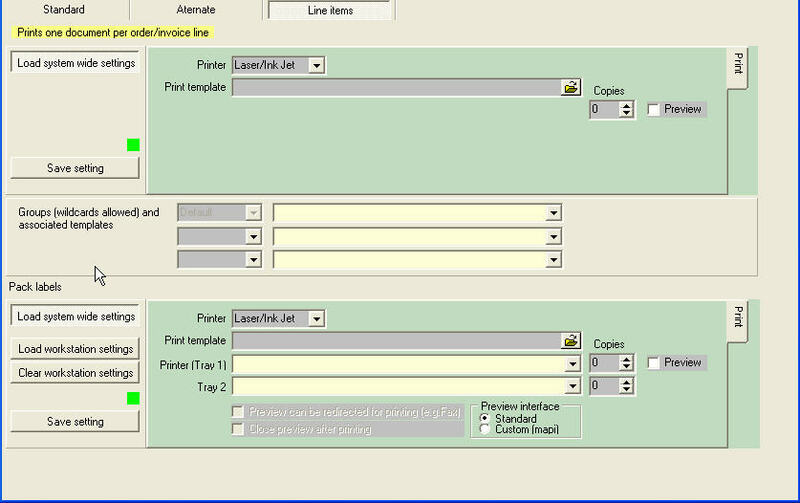 With special program versions, this option allows you to set up a situation where different groups of products may have special templates that may be redirected to printers in different areas of your factory or offices. Each line of a picking slip, for example, would produce a separate document. There is also a facility to produce packing labels with full details of the item packed. A full explanation of this function will be given on request.